Cheering for the local soccer team at the Stadion... Drop the textbook formality and chat with the locals in Germany's everyday language. - What's up? Wie geht's? - He/She is a real hottie. Er/Sie ist eine ganz hei e Nummer. - What's on tap? Was gibt's vom Fass? - I ordered the Currywurst. Ich bin den Currywurst. - Do you wanna cuddle? Willst Du kuscheln? 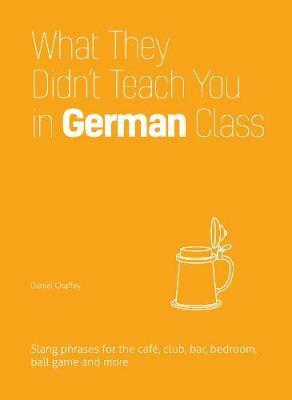 Daniel Chaffey is a writer, scholar, educator and eternal student of all things German. He has lived and worked in Germany for much of the last 12 years as a student, Fulbright Teaching Associate, translator and bartender, where he perfected his high German skills and learned to converse like a German sailor. He holds an MA in German Studies and a teaching credential from Cal State Long Beach. He currently teaches German in Northern California where he continues to work on other projects, including a lexicon of soldier slang from the Second World War.